This weekend I visited my parents and felt like baking. 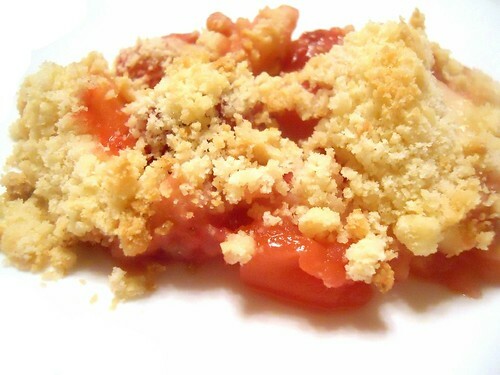 Thus I ended up making apple and strawberry crumble. In the summer my fruits of choice would definitely be plums or apricots. For the winter there is nothing better than apples. Nicely surprising, due to the strawberry all the fruit layer turned deeply red and appealing. The ready crumble disappeared almost completely in the first 30 minutes of its life, while it was still hot and melting into vanilla sauce I served it with. I felt really rewarded to get such a result out of such a simple recipe. Toss the apples with strawberries and caster sugar and place them into deep baking dish (normally would be square or rectangle, but I used a round one this time). Combine flour with icing sugar and chopped butter to get even and light crumbs. You can either use a food processor or do it manually. If you are doing the latter, take a big knife or iron spatula and mix the flour with butter cutting it across. When the butter pieces get small, use your hands to completely stir the butter in and get the crumbs ready. Scatter the crumbs over the fruits. Bake at 180C for 45 minutes. Take out and serve warm with ice-cream or vanilla sauce. This time I served it with my favorite creme anglaise.